Not one, not two, but three of my favorite historical-romance authors have books out this month! In case they’re not already on your radar, allow me to put them there. 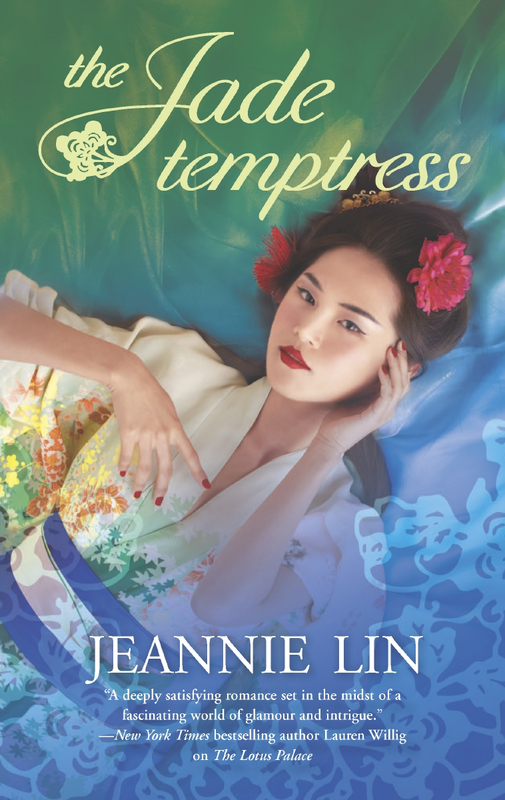 The Jade Temptress by Jeannie Lin, released March 1. Dramatic backstory: In December, Lin blogged candidly about some disappointing news: sales for The Lotus Palace, first book in her new series, had been so poor that Harlequin canceled the print release of the series follow-up, The Jade Temptress, opting to publish it in e-book form only. This was a demoralizing development for those of us who love Lin’s writing, those who appreciate her candor and wish her well, and those who’d like to see more diversity in the settings and stories of historical romance. Pretty much everyone I know who’s tried one of Lin’s books has become a fan; it was frustrating that more people weren’t trying her. Then, a plot twist: Harlequin put The Lotus Palace on sale for 99 cents – and it sold. It sold enough copies to land on the USA Today bestseller list. Lin blogs about that slightly surreal experience here. So now The Jade Temptress is out, and not only am I looking forward to reading it, but I’m hoping hard that a good number of the e-book readers who snapped up The Lotus Palace will move on to the sequel. And here comes my quick sales pitch: if you like historical romance, but worry that Tang Dynasty China is too far removed in time and courtship conventions to give you all the familiar pleasures you look for in romance, well, first of all I hear you because those are the same reasons I don’t read Medieval. And second of all, I think you need to read Jeannie Lin. If you like formidable women and and upstanding men who have a weakness for formidable women; if you like pulse-pounding action scenes; if you like vivid world-building and plots that turn on questions of honor, then I think her books are for you. Dramatic backstory: Lerner debuted in 2010 with the utterly charming marriage-of-convenience Regency In for a Penny. It got superlative reviews and she was voted Best Debut Author in the year-end poll at All About Romance. Her career was off to an auspicious start. Then her publisher, Dorchester, already in financial trouble, started crumbling in earnest. They pushed back publication of her follow-up book, and pushed it back again, and finally released it in trade paperback instead of romance-friendly mass-market, shortly before they went under completely. Lerner talks about the Dorchester experience, with its feelings of helplessness and irrational shame, toward the end of this interview. So we’ve had a long wait for another Rose Lerner book, but it’s finally here, and I’m lucky enough to have read it already and I can tell you it’s a delight. Slightly-less-dramatic backstory: I’ve said before that if for some reason I had to give up reading every romance writer but one, Duran would be my keeper. It’s probably still true. But I have to admit I’ve fallen two and a half books behind on her oeuvre. I think where I stumbled was when she released At Your Pleasure, which, departing from her usual Victorian setting, took place in early Georgian times. I don’t know a lot about early Georgian times, so, like someone who hesitates to pick up a book set in the Tang Dynasty, I kept finding something else to read. It’s not that I ever decided not to read the book; other things just kept leapfrogging it on the TBR pile. And before I knew it her next book was out – That Scandalous Summer, another Victorian – and I thought, “No, I still have to read At Your Pleasure before I read this one,” and again, I kept finding other things to read. But Fool me Twice, sequel to That Scandalous Summer, is out this month and I’m hearing a lot of good buzz. And it was on sale for $1.99, and so was TSS, so I gave up (for now) on AYP and bought and started TSS. As of this writing both That Scandalous Summer and Fool me Twice are still $1.99 in ebook. If you haven’t read Duran, this is a great opportunity to see why she’s such a favorite of mine. What books are coming out this spring that you’re excited about? And if you had to give up every romance author but one, who do you think would be your keeper?